“Today the overall size was better on average,” Johnston says. 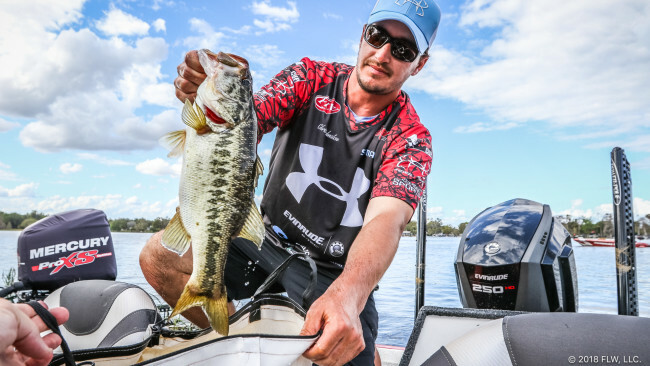 Johnston’s key baits in the morning are a jerkbait and lipless crankbait. The fish are feeding on a shad spawn, and reaction baits have been the ticket in the low-light period. Both baits have produced big bites. The lipless duped the 8-6 bass yesterday. Johnston plans to start on his honey hole once again in the morning and keep watchful for schoolers. With the bed-fishing bite heating up and others behind him in the standings working that program, he knows he’ll need to be prepared to pack up and regroup quickly if the morning flurry never comes.